When we consider airport security screening we have to take into account that air travel, airline regulations, and airport screening have gone through numerous changes over the last decade or so. It seems we are hearing about new changes all the time. This makes it imperative that you check with your airline before you pack your suitcase. Even if you haven't traveled in a while or are a seasoned traveller you may find this information very useful. Before you pack your luggage you will need to know the latest weight restrictions and rules for both your carry-on luggage and your checked suitcase. Make sure that you know what size bags you will be allowed. For regular checked luggage it is usually 23 kg (50 lbs) 62in (158 cn) in total linear dimensions. The first class may be more with some airlines. I have seen them let you split the weight between two bags, and most will allow a carry on 9x16x20inches and 10 kg or 22 lbs. If you will be changing flights ask if your luggage will be forwarded on to your final destination or will they have to be checked again. The regulations for the first leg will usually apply even if changing carriers. On the way home it will be the same. The first carrier of your flight will set your regulations. Most will allow a purse or computer bag 6X13X17 in 10 kg or 22 lbs. This changes so it is important that you check before you go. My cousin and I still laugh about our first trip out of province on our own as teens. My purse was like a suitcase and everything was falling out of it as I ran to catch my train. We can’t do that anymore! Check your flight status and alerts before leaving for the airport. Know how long you are required to arrive before your flight time. Allow enough time to get to the airport so are not rushing. We used to get there with just a short time to go through airport security screening but it does seem to take longer now and some airports are worse than others. Also, it depends on your destination.Even when flying out of Canada it depends on where you are going. If you stop over in a U.S. city, even if just to change flights, the airport security is more intense. This is true from Puerto Vallarta and other parts of the world also. 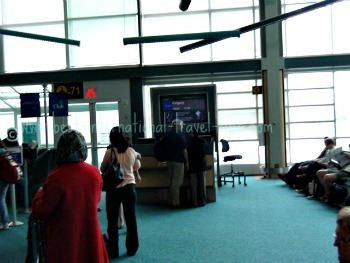 When we come back every year from Mexico, if we are going direct to Canada, it is normal screening. If your plane stops in the U.S. at all then they hand check your carryon again before getting on your plane. This is after going through regular airport security screening and waiting at your gate. When going through U.S. customs at our Canadian airports you are considered on U.S soil. The odd time, now when the U.S. is on high alert, they will not let you board with a carry on. No matter what your air line states, you could be stopped and have to check your carry-on bag. If flying with a small plane you may have to remove your computer and then check your bag. Even if you are just stopping in the U.S. to change planes this could happen. Make sure that anything really valuable could be switched to a purse if this happens. I usually have my jewellery, money, passport, medicine, tickets and anything I will need on the plane in my purse inside my carry on and I can easily remove it if I must. I have seen pandemonium break out during airport security screening when people are not prepared for this. I usually take less than my allowed weight and it gives me room to bring some things back with me. Never over stuff your suitcase. It could make it difficult for them to close it and break the zipper. You don’t want to loose stuff. However don’t pack so light that everything is banging around as things could open or break. Remember they will get thrown around and dropped off of trailers etc. I never take more than one checked bag and one carryon bag no matter how long I am going for. I want to be able to handle my bags by myself as it makes it easier to get through the airport security screening. Put your shoes on the top of everything else inside your checked luggage. It makes it easier for them to get at them without messing everything up. Also, if your things are in plastic see through bags they will have an easy time of checking. Check and make sure that you are not packing any dangerous goods. Do not wrap gifts. Make sure that you have your luggage tagged with your name and email address with one of their tags on the exterior. Were they will see it on opening the luggage have a note with your name, address and telephone number, both for your home and for your destination. Also write your itinerary on it if you will be going to more than one place on your trip. If anything happens to your luggage they can forward it onto you. Lots of theft happens on international flights. Use the new type of approved locks that they can open. This will give you added peace of mind knowing that only official security officers can get into your suitcase. Some countries open your bag and check it in front of you. Have a look to make sure that the person checking you in has put the right destination ribbon on the suitcase. Most lost luggage gets it start here. They will weigh your luggage and take care of your check in. Don’t over pack you will pay! $$ Most airlines have the auto check in now. You can get your boarding pass on-line and print it out or you can do it at the kiosk when you get to your airlines ticket counter. It is a very simple process with a touch screen and usually airline employees to assist if needed. Have your passport out ready to scan it. I like to do this as it is very convenient. There is even a drop off for your checked luggage. Have your boarding pass out ready to show the security officer, they may also want to see your passport. When at the hand luggage airport security screening check point take a tray. Wear shoes that you can easily slip off and on as you may have to put them in your tray. Some airports now have a pad that you step on to check your shoes so that you do not have to take them off; however, most don’t. Do not put gel pads for your shoes in your carry-on bag and do not wear them going through the airport security screening process. Have your small plastic bag with your liquids and gels handy near the top of your packed carryon so that you can put them in the tray. Also I like to use small plastic bags to put keys and change and jewellery anything that they may want to look at so that it is easy to get at them. Have your computer or other electronics packed so that you can easily take them out and put them back without holding everything up. Your computer goes on the tray. When signaled put all your hand baggage and tray on the conveyor belt and go through the arch. They may require that you pass through a full body scanner. It all should just take a few minutes. Take the time to put your things in order again before proceeding to your gate also make sure that you have not left anything behind. Some airlines like you to check in at the desk at your gate to show that you have your papers in order. If you follow the airline rules and regulations pack carefully and are organized you will be processed through the airport security screening stress free in no time. Then you can sit in your gate area relax have a beverage ready to board your flight. Maybe you would like to pick up duty free products. The rules have changed for this also. Check when you arrive at the airport before you make your purchase of any liquids especially if you have a stop over and your bags have been sent on to your final destination. Be careful what you pack in your carryon. I thought I checked the regulations and decided that I would give myself a manicure at my long stop over. They had the correct length but were pointed so I had to let them throw out the scissors. They had to pull them out to see what they were. I normally breeze through the checking. Everyone is pretty nice to you just don’t get irritated if something goes wrong. It is all just part of travel and all these airport security screening changes are making things safer for you in the long run. pack smart - Canada everything you need to know and kept up to date.